(Newser) – A House intelligence committee report issued Thursday condemned Edward Snowden, saying the NSA leaker is not a whistleblower and that the vast majority of the documents he stole were defense secrets that had nothing to do with privacy, the AP reports. The Republican-led committee released a three-page unclassified summary of its examination of how Snowden was able to remove more than 1.5 million classified documents from secure NSA networks, what the documents contained, and the damage their removal caused to US national security. "He put our service members and the American people at risk after perceived slights by his superiors," says Rep. Devin Nunes, chairman of the committee. He could have screamed at the top of his lungs that the Gov't was spying on it's citizens (something we already knew). Dumping 1.5m documents makes him a traitor. Let him rot in Russia. The congress left over from the Bush years, and the Republicans running the shows now aren't patriots. They would sell us all out for campaign funds from AIPAC and trash the constitution to please the dual citizen Israeli who have infiltrated our government at all levels. So our congress is willing to spy on us with the help of the Israeli contractors who are in the business of spying through our telecommunications and keep an actual patriot who warned the American people our rights were being stepped on out. This is the congress that just appropriated $38 BILLION to Israel! For what! To keep spying on us .... and them? All that spying did not help us with 9 11, did it? 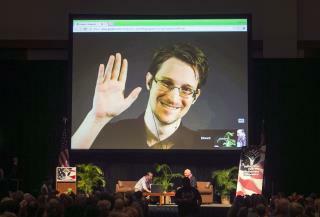 Snowden deserves a pardon and the Israeli needs to be cut off without a cent.